Well worth a visit any time of the year, a walk at Philopappos Hill is a rewarding experience. Here you will discover an unexpected park, important monuments such as the so-called Prison of Socrates, the Tombs of Kimon, the ancient Koili Odos street, which was a mercantile boulevard with both shops and houses, Iroon Mousaiou, the Philopappos Monument and a spectacular view of the Parthenon and the Acropolis. ​From this height one enjoys a splendid view, especially at sunset, of the Propylaea, the temple of Niki (Victory) and the Parthenon streaming with rays of the setting sun. To the west of the Acropolis one can see Thesseion and the Hill of the Nymphs, and beyond them the Athenian plain, bounded by Mt. Aegaleo and Mt. Parnon. Over the Acropolis, the Lycabettus Hill and, in the background, Mt. Penteli. To the south lies the Saronic Gulf with its countless isles and serpent-like coast. ​In the 1950’s architect Dimitris Pikionis developed the design of the area encompassing the Propylaea of the Acropolis and Philopappos Hill. Take note of the handmade marble cobbled roads leading to the monuments. The area has been designated a Scheduled and Protected Monument of the Global Cultural Heritage. Rendering of the Philopappos Monument by James Stuart and Nicholas Revett, 1794. ​The monument consists of a square construction of white marble from the quarries of Mt. Penteli, cir. 14 m. (40 ft.) in height and 10 m. (33 ft.) in breadth, whose NorthEastern front turned toward the Acropolis, formed a half-circle, the only part of the edifice existing today. The monument contained Philopappos’ burial chamber. The structure is built on a socle 3.08 meters high, made of porous marble and veneered with slabs of marble from Mt. Hymmetos. The north side of the monument bears lavish architectural decorations. The Monument of Philopappos in 1794, by James Stuart and Nicholas Revett, London. The decorative structure was ornamented with pilasters, reliefs and statues. The reliefs represented king Philopappos as a Roman Consul and an Athenian citizen on his chariot, inaugurating his consulship in the year 100 A.D. Above, in three niches between pilasters and Corinthian pillars, the statue of Philopappos in the center; that of his grandfather Antiochos IV on the left; on the right, according to Cyriakos of Ancona, a tourist to Athens, was the statue of Seleukos I, Nikator, founder of the dynasty. ​The fine monument of Roman times, erected by the Athenians in commemoration of the Syrian king, benefactor of Athens, was destroyed in the 17th century. Recent investigations have certified that architectural elements of the Philopappos Monument were used by the Turks for the construction of the Minaret in the mosque within the Parthenon... It was from the summit of this hill that Italian General (moron) Morosini bombarded and almost destroyed the Parthenon on September 26th, 1687. Close to the site we recommend Herodion hotel for you, an excellent medium-size hotel just a few hundred yards away from the Acropolis and Herodeon, offering modern, elegantly decorated air-conditioned rooms, fitted with a satellite TV, safe and soundproof windows. 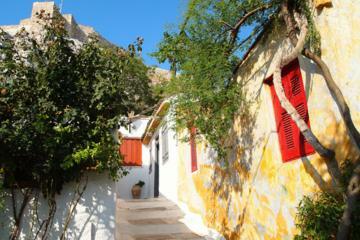 ​Most rooms have private balconies and some have a view of the Acropolis. It has a beautiful roof garden with lounge chairs and 2 hot bathtubs with spectacular views of Athens. The rooftop restaurant is fitted with a decked terrace, serving Mediterranean cuisine and cocktails. In between, guests can enjoy snacks and homemade desserts in the semi-outdoor area in the hotel's back garden. An indoor restaurant is also included, where breakfast is served. Roof garden, Herodion Hotel, Athens. ending with a Greek picnic and glass of white wine! Your expert local guide will introduce you to the gentle hills around Athens’ Acropolis, chatting about the area’s ancient history as you go. Discover the charms of Plaka (Athens’ Old Town), Anafiotika with its pretty Greek island-style houses and three of the city’s famous hills: Philopappou and Mars Hill.